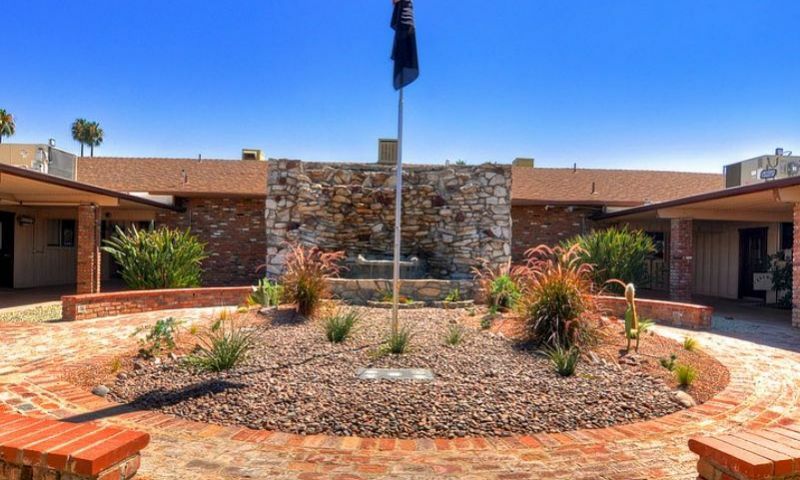 Sun City is a beautiful active adult community located in Menifee, California. Sun City was the first master-planned community of its kind in this area. The main area of Sun City is made up of 4,762 residences and all are members of the Sun City Civic Association. There are low-maintenance single-family homes and attached homes that provide open floor plans perfect for today’s active adult buyer. This stunning 55+ community offers a small town setting with world-class amenities. Sun City offers an abundance of indoor and outdoor amenities that are ideal for homebuyers looking in the Inland Empire area. With plenty of activities and events, residents always have fun within the Sun City community. An exciting lineup of amenities awaits the residents of Sun City. Civic Hall, North Town Hall and Webb Hall are the hub for all activities in the community. North Town Hall and Webb Hall are the perfect places to host a party as they both hold up to 500 people. Residents can partake in a variety of physical and social activities while they mingle with new friends and neighbors. Residents can get in touch with their creative side in the woodworking shop, lapidary studio and ceramics studio. There is also a card room, fitness center, billiards room, table tennis, and indoor shuffleboard courts. Outside, residents can take a dip in one of the two outdoor pools, enjoy the outdoor amphitheater or have a barbeque with friends on the patio. Residents can also get competitive on the horseshoe pits, lawn bowling, bocce ball and tennis courts. Sun City is an established community of 4,762 residences that were built by Del Webb and Presley Co. between 1962 and 1981. There are a wide variety of housing styles at Sun City to match the preferences and budgets of almost any buyer. Homebuyers can select from single-family homes or attached homes. The attached homes feature one to two bedrooms, one to two bathrooms and a garage or carport. The attached homes are the perfect option for those looking for a low-maintenance home where they don’t have to worry about yard work. The single-family homes are the perfect option for those looking for a little more privacy and more living space. The single-family homes feature two to three bedrooms, one to two bathrooms, and a garage or carport. Sun City offers an active lifestyle for those who are 55 or better. There are plenty of activities available in Sun City. Whether your favorite activity revolves around social clubs, sports teams, or simply mingling with friends at various community events, there is something for everyone at Sun City. There are over 40 social clubs and interest groups that meet on a regular basis. Some of the more popular groups include bridge, billiards and Mah Jongg or craft and hobby clubs like knitting, needlecraft, ceramics and jewelry club. Sports enthusiasts enjoy the various fitness-minded clubs such as tennis, Tai Chi, shuffleboard, lawn bowling and chair volleyball. Other residents find joy in book clubs, garden club, woodshop, travel club, swim club and organ and piano club. Whether you are interested in rekindling an old hobby or starting a new one, Sun City offers an exciting array of activities and clubs. Sun City is located in Menifee, California just off of McCall Boulevard. It is minutes from Interstate 215 making trips to Los Angeles, Orange County, and San Diego a breeze. The cultural and entertainment venues along the Southern California coast are endless. Whether you want to enjoy world-class shopping, great restaurants, sandy beaches, or professional sporting events there is something for everyone. Residents can enjoy hours of gambling at Pechanga, Pala or Morengo Casinos. Sports enthusiasts can attend a Lake Elsinore Storm minor league baseball game or play a round of golf at the Menifee Lakes Country Club. The Santa Rosa Ecological Reserve and Diamond Valley Lake provide gorgeous views while fishing, hiking or boating. With such a convenient location, it is easy to see why Sun City is a desirable active adult community in Southern California. Sun City offers a wide variety of amenities to stay active and social within the community. North Town Hall is the perfect place to host a party or club event. It holds up to 500 people and has more floor space than Webb Hall. Webb Hall also holds up to 500 people and is a great place to have a private party. It is a little smaller than North Town Hall but has a bigger stage. There are plenty of activities available in Sun City. Here is a sample of some of the clubs, activities and classes offered here. The attached homes feature one to two bedrooms, one to two bathrooms and a garage or carport. The attached homes are the perfect option for those looking for a low-maintenance home where they dont have to worry about yard work. The single-family homes are the perfect option for those looking for a little more privacy and more living space. The single-family homes feature two to three bedrooms, one to two bathrooms, and a garage or carport. There are many home styles and prices to accommodate almost any buyer. Most homes north of McCall have double garages, not just carports. My home has extended or tandem space in the double garage, and since it is a corner lot, we also have two paved driveways, with space for a motor home. This is agreat place to live. I have been here eight years and have hundreds of frends in the community due to joining the indoor shuffleboard club, and the Friendship club. Association dues here are only about $25 per month, paid annually. We have wood shop, jewelry making, artist shops, Wii, two pools, jacuzzi...exercise rooms, etc. 55places.com is not affiliated with the developer(s) or homeowners association of Sun City. The information you submit is distributed to a 55places.com Partner Agent, who is a licensed real estate agent. The information regarding Sun City has not been verified or approved by the developer or homeowners association. Please verify all information prior to purchasing. 55places.com is not responsible for any errors regarding the information displayed on this website.